"I think it's a huge mistake for Samsung to do this," agreed Patrick Moorhead, an analyst with Moor Insights and Strategy, referring to the sale of refurbished Note7s. "The Galaxy S8 will likely do well, so why risk it? The longer the Note7 is forgotten, the better for Samsung." 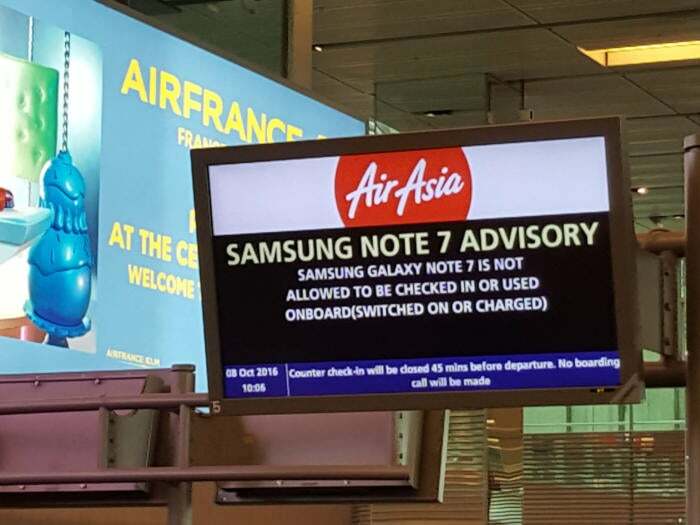 A sign advises against use of Samsung's Note7 in aircraft at Changi Airport in Singapore on Oct. 8, 2016. Several analysts and industry insiders said it is unlikely that Samsung would find a market for refurbished Note7s in the U.S. or Western Europe, but could do so in India, Asia Pacific or Latin America, depending on the price. Samsung confirmed in a statement to Computerworld late Tuesday that it won’t sell or rent refurbished Note7s in the U.S. The company will provide refurbished Note7s in some markets depending on consultations with regulators and wireless carriers. Product details, including name, specifications and price range will be announced when the device is available, a spokeswoman said. “The objective of introducing refurbished devices is solely to reduce and minimize any environmental impact,” the Samsung spokeswoman said. The company has already instituted an eight-point safety check for testing its batteries since the Note7 fiasco and has appointed a team of academic experts to research future battery technologies.